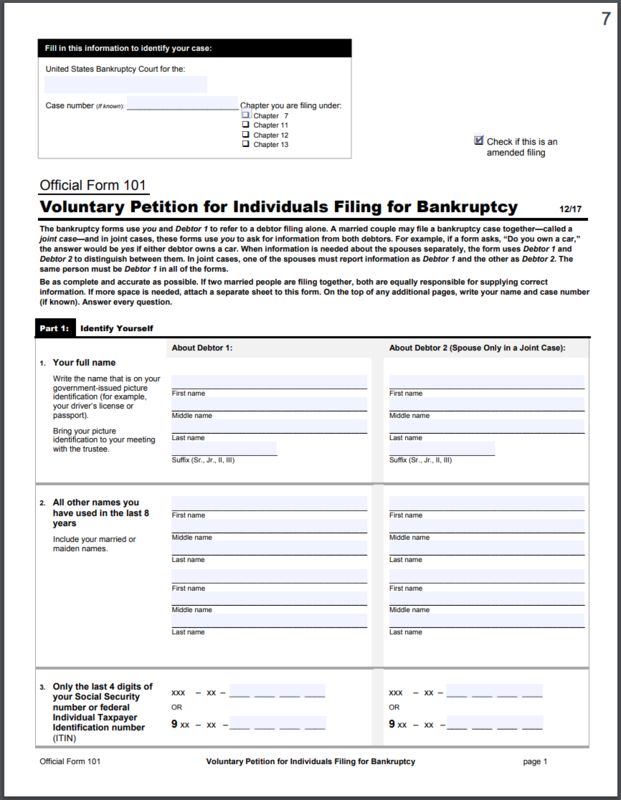 What are the Bankruptcy Forms? At first glance, the bankruptcy process can seem overwhelming. The Petition is a series of different forms that outline your financial resources and obligations. It is how you show that you are unable to make ends meet. At filing, you will need to present a few other documents including your certificate of financial counseling, your redacted tax returns and pay stubs. This article focuses on what many feel is the more complicated part of the bankruptcy process: the Petition. It discusses the different forms and the information that you will need to provide to complete them. This summary compares all the property you own to all the debts you owe. It functions as a snapshot of your financial situation and shows how and why your money adds, or doesn’t add, up. The Schedule A/B outlines all of the property you own both “real property” (like a house) and “personal property” (like clothes and furniture). This can also include cars, household goods, cash, checking accounts, savings accounts, stocks, bonds, and life insurance. You’re basically being asked to itemize every single item that you own. The Schedule C is one of the most important sections of the entire Petition. This section re-lists all of the property that is listed in the Schedule A/B with one additional step: it asks you to assign what is called a “property exemption” to each item. Property exemptions basically tell the court that certain property items that you own are protected from being seized. Meaning that the court can’t take them away to try and pay off your debts. The Schedule D is where you list all the people that you owe where the debt is secured by property. These are typically items like car leases or home mortgages. In Chapter 7, these items are generally vulnerable to being repossessed by the bank if you are behind on the payments. However, in certain cases, you can keep the property if you are up-to-date on the payments. The Schedule E/F may be the most used section of the Petition. This is where you list all of the people and companies that you owe money to. These debts typically include everything from utility bills, medical bills, taxes, family loans, payday loans, judgments, etc. Schedule G asks you to list any contract where both parties still need to do something for the other. For example: rent. You have to keep paying rent, and the landlord has to keep providing the apartment. Other examples include: equipment rentals or development contracts. With these debts, known as “executory contracts,” you have to decide whether you want to commit to the debt, drop it, or assign the debt to someone else. The Schedule H is where you list the people who you share debts with, aka your “codebtor.” Often times this is a spouse or some other co-signer. The Schedule I is where you list all of your monthly income. Any money that you have coming in gets written here. You’ll cover how much you make from things like your pay stubs (if you’re currently working), your social security, SNAP, disability, insurance, and family support. The Schedule J is where you list all of your bills and expenses for each month. This will be everything about how much you spend on children, utility bills, gas, insurance, etc. • Declaration About an Individual Debtor’s Schedules This form is basically a formal statement saying that all the information that you provided in the different schedules is true and accurate to the best of your knowledge. Your signature on this page is basically a promise to the court that your filing is legitimate, honest and should be take seriously. • The Statement of Financial Affairs is one of the more important forms in the petition. This is where you provide more context about your financial history by listing your annual incomes and any family or government assistance you’ve received in past years. This is where you will also right any special circumstances associated with your case. Events such as property transfers, repossessions, or even a business will be relevant here. The Statement of Intention ties directly to the Schedule D: Secured Creditors and the Schedule G: Executory Contracts. This is where you indicate whether or not you plan to remain responsible or for certain debts that you still owe for property. 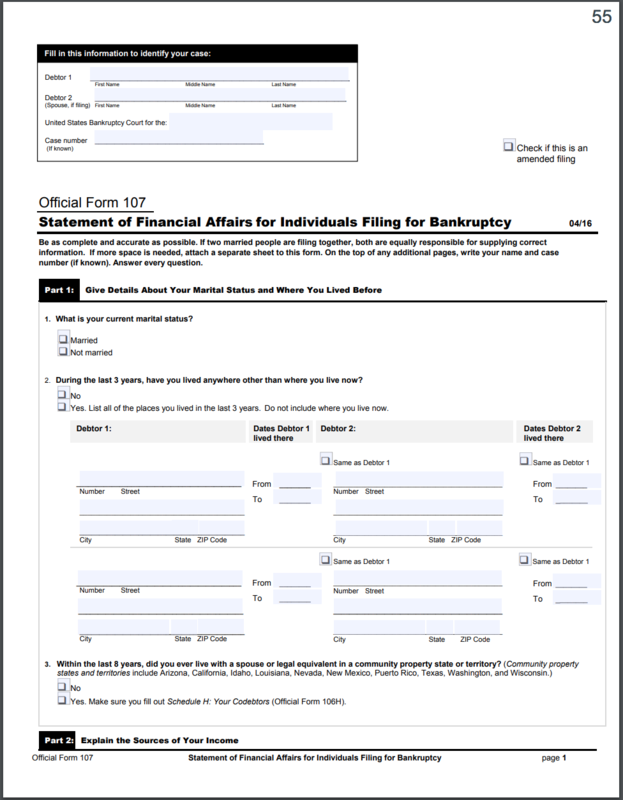 • Your Statement About Your Social Security Numbers This form simply confirms your social security numbers are listed completely and accurately. The Statement of Current Monthly Income is one of the most important forms in the Petition. However, it is sometimes misunderstood. Although it’s name is “current” monthly income, it is really asking you for the average monthly income that you have received over the last six months. 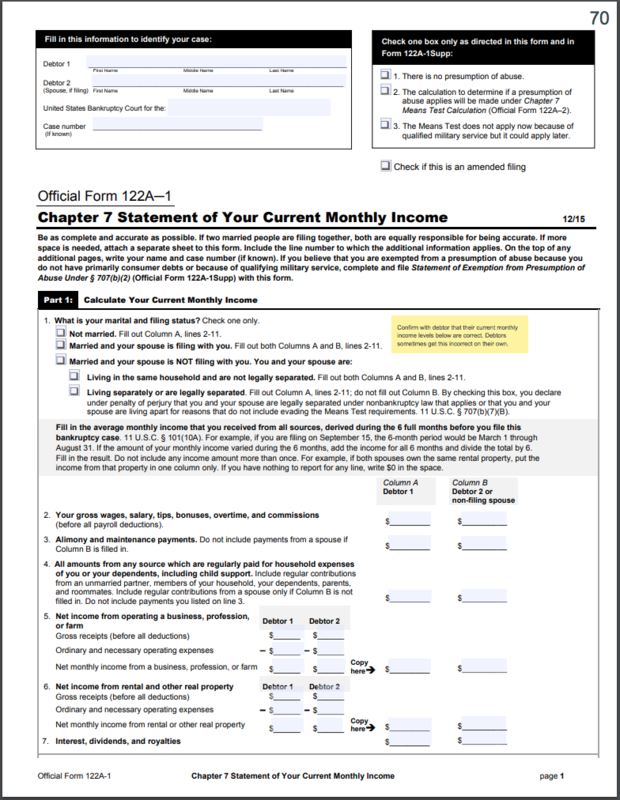 This form is an opportunity to respond if the Statement of Current Monthly Income section says that you don’t qualify for Chapter 7 based on the Means Test. Here you will, once again, outline your expenses in an effort to show that you are eligible and need to file under Chapter 7. Some people are able to cover the bankruptcy filing fees, but just not all at one time. In these cases, you can complete this form to ask the court to let you pay it in smaller chunks. Often, this fee is broken down into two to four payments. The bankruptcy filing fee is $335. Many people who are filing cannot afford to pay that. In these cases, the person filing asks the court to excuse them from having to pay. One of the ways to tell if you are eligible to have your fee waived is if you have less than $80 left over at the end of the month once everything else is paid for. If you’re below 150% of the poverty line, you are generally eligible for the waiver. This form is used if you’re behind on your rent and your landlord has received a judgment to evict you. It sometimes allows you to stay in your home if you put a certain amount of money down with the court. 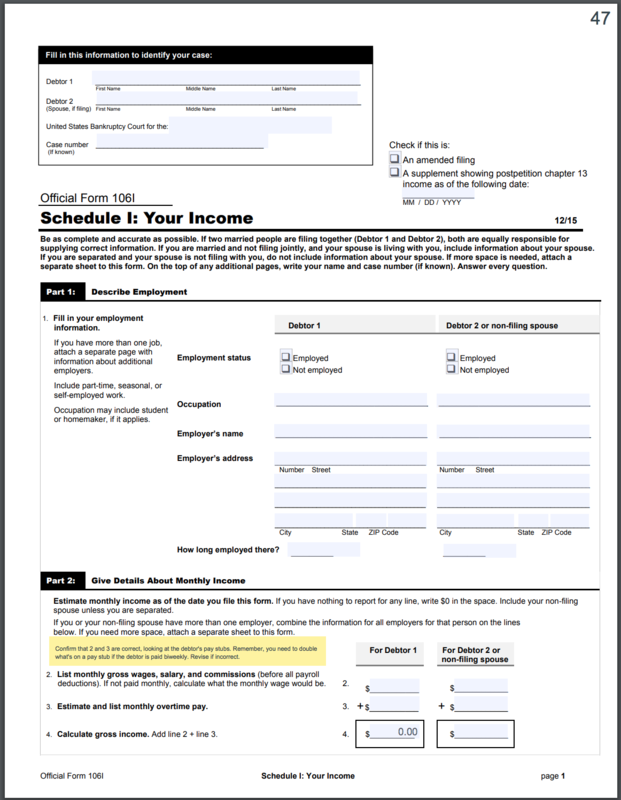 This form is similar to the one above, but comes into play if you’re attempting to stay in your home for more than 30 days after you file. Schedule J-2 is used when you are filing jointly with someone, often a spouse, who maintains a different household. Here, you or the other filer will list their monthly expenses just like in Schedule J. Keep in mind that you typically have to be below the median income to be eligible to file for Chapter 7. However, there are some cases where a person actually makes above the median income and still chooses to file through Chapter 7. This form is used to say that even though you make more than what is generally allowed under Chapter 7, you don’t have enough to fulfill a repayment plan under Chapter 13. As you can see, the bankruptcy process involves information that you likely already know or is easy to get. The hardest part is typically understanding what each form is asking you to provide about your situation. 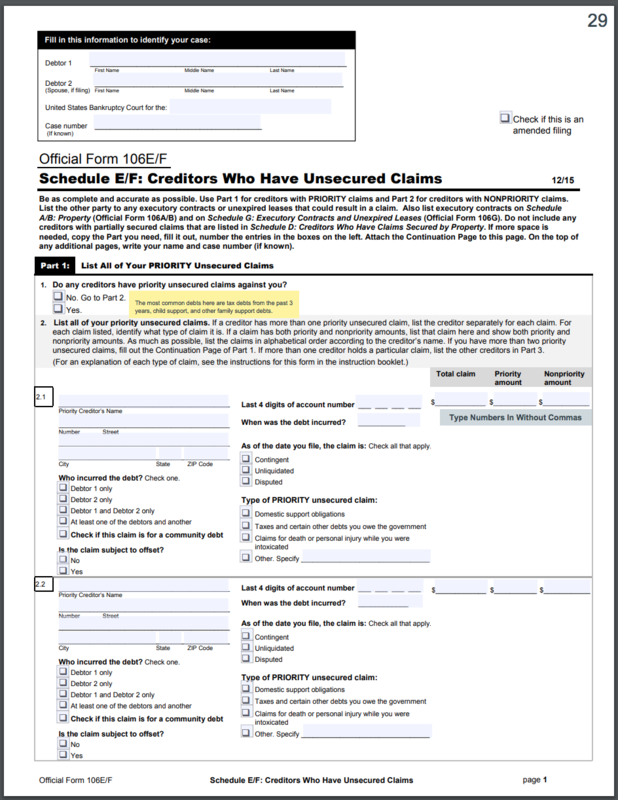 The required forms are simply looking for you to outline your financial circumstance: all of the money you make and all of the money that you owe to others. It will be up to you to decide what optional forms you need to submit depending on your situation. Hopefully the brief summaries above were helpful to understanding what forms are relevant to you.